Legendary New Jersey prog rock band Mastermind has been flying under the radar for some ten years now. Insomnia, their seventh album, is their first full length release in ten years. Recently signed to Lion Music, Mastermind, known for original song composition and experimentation, takes a slighty different turn on their latest. Insomnia is built more upon the song than prog impressionism, and around the vocals of new singer Tracy McShane. Indeed, if Mastermind, and founders the Berends brothers, wanted to Ms. McShane, then she certainly steals the limelight throughout, and she's simply wonderful on One More Night, Desire, and No Answer. Yet, the progressive compositions which made Mastermind famous are not forgotten here. The aforementioned One More Night is a firm example as are Meltdown, Night Flier, and Piggy World. Then there are songs that combine the best of these elements. Broken shines as well rounded and crafted song while bringing an epic progressive sound accented by McShane's vocals. This is one of those songs, and moments, where you say wow, because it all comes together in a hugely entertaining piece. Following this same idea, the melancholy epic (over nine minutes long) Last Cigarette may remind of past Mastermind performances. Again, the Berends brother's composition and musicianship combined with Ms. McShane's vocals create a stirring portrait of their profound skills. 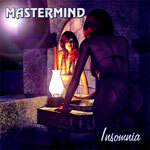 On Insomnia, Mastermind set out to craft an album strong on song composition and featuring new vocalist Tracy McShane, but without abandoning their progressive experimentation. They have succeeded. Insomnia is a sterling work. Welcome back Mastermind. Very recommended! On Insomnia, Mastermind set out to craft an album strong on song composition and featuring new vocalist Tracy McShane, but without abandoning their progressive experimentation. They have succeeded. Insomnia is a sterling work. Welcome back Mastermind.